Fr. Matthias Shehad was born of Egyptian parents in Glasgow, Scotland on 9/17/1977. His family immigrated to the US in 1980, and he has lived in Houston, TX ever since. Mr. Shehad has a BS degree in Computer Engineering from the University of Texas at Austin (1999), and a Master's of Electrical Engineering from Rice University (2000). 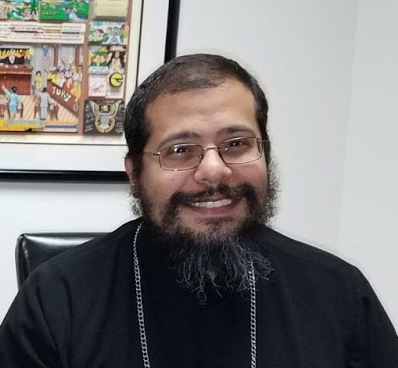 He worked as an Electrical and Software Engineer for 15 years until he was called to ministry and ordained a Coptic Orthodox priest on 6/28/2015. He served at St. Mark Coptic Orthodox Church in Bellaire, TX until July 1, 2017. He was then transferred to St. Paul American Coptic Orthodox Church also in Houston. Mr. Shehad teaches a course on evangelism at St. Athanasius Theological Seminary in Titusville, FL, as well as courses on Evangelism and World Religions at a summer servants preparation program at St. Mary and St. Moses Abbey near Corpus Christi, TX.